(Name and date of birth/Passport number). Dedication of 6-word-text is possible. All dog-tags come with a stainless steel ball chain. 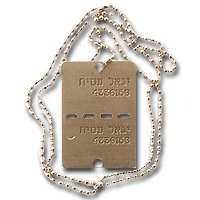 You can purchase Israeli Soldier's Dog Tags Covers.